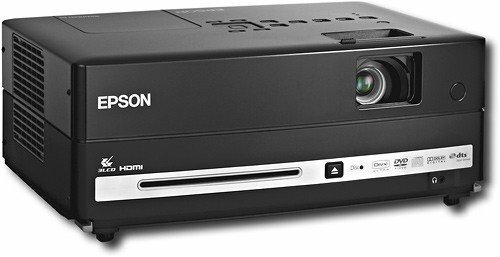 Experience the ultimate versatility in widescreen, high-definition home entertainment with Epson MovieMate 85HD, a powerful projector, DVD and music player combo that brings you brilliant blockbuster performance. Just plug, load and play. Get larger-than-life entertainment — anytime, day or night — with 2500 lumens of color brightness. A sleek, portable performer, Epson MovieMate 85HD includes a built-in DVD player and dual Dolby® 5.1 Digital DTS® 10 W stereo speakers. Add to that its convenient HDMI connectivity and you've got everything you need for amazing HD adventures. Goes great with our inflatable movie screen! $35 plus tax per day!